Today, we will be discussing the ṣawt form that we have read about in the music books of the Abbasid era. This form has changed since that time and exists today in Yemen as well as in the countries of the Arabian Gulf. In today’s episode, we will focus on the ṣawt form in the Arabian Gulf, specifically in Kuwait. The discussion will be conducted by Mr. Kamal Kassar and an expert on the subject, Mr. Ahmad al-Salihi. – a vocal form that includes ṣawt and other types that are not called ṣawt. Let us first discuss the ṣawt as a rhythm. There are 3 or 4 rhythm types: the 6/4 ṣawt ‘arabī; the 4/4 ṣawt shāmī; the fast 12/8 ṣawt khayālī or khayyālī. Now concerning the ṣawt as a form: there are other fann –that are not ṣawt– that are only performed in a ṣawt jalsa, such as the istimā‘ and the khitām. The istimā‘ is the first vocal part in the jalsa (in the past). Within a jalsa, the muṭrib first plunks the ‘ūd and sings a istimā‘ –an ordinary song with no percussion accompaniment. There may be a ‘ūd, a violin, and a qānūn, but no percussions, even though the singing is muwaqqa‘… it is not a mawwāl. After the istimā‘, he sings ṣawt. Before going to the ṣawt, would you play a istimā‘ for us? After the istimā‘, he performs the two major forms, i.e. the ṣawt ‘arabī and the ṣawt shāmī that remain, to-date, the two most important forms of the ṣawt. What is the ṣawt ‘arabī? Following the rhythm categorization, the ṣawt ‘arabī’s meter is 6/4 while the ṣawt shāmī is a little fast, i.e. 4/4. There are of course many different melodies, and all of them are sung in turn, i.e. when the muṭrib sings ṣawt ‘arabī, he sings ṣawt shāmī at the end of the melody, then shifts to another ṣawt ‘arabī… etc. He inserts one ṣawt khayālī in the middle then goes back to the ṣawt ‘arabī then the shāmī or the other way around. The jalsa ends with a form called the khitām or khatm. 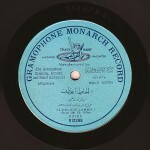 Today the khitām is played as a ṣawt khayālī, while it was played in the past to the 3/4 rhythm, particular to this form –recorded and documented. The khitām form is a unique melody supporting different lyrics such as local poems, either nabaṭ, or literary, or Yemeni ḥumaynī, or any other existing poem that can be sung in this form, yet always to one unique melody. What do you mean by one unique melody? One same melody. Consequently, the Gulf artist had to be creative, and add variations mostly to the performance and a little to the maqām. The melody is originally to the bayyātī, played either to the ḥusaynī or to the ḥijāz. They performed variations or musical additions, but in the end the melody remained the same. It is supposed to be accompanied by percussions… it is initially. Is there a unique maqām in the ṣawt’s faṣl? There is no unique maqām, rhythm, or poem. The only common unique ground is the structuring of the forms, nothing else. There is no common element linking the songs. I have mentioned that the ṣawt form includes the ṣawt fann as well as other types: the istimā‘ and the khitām. The khitām of course is not called ṣawt khitām. It is only a khitām not a ṣawt, and the same goes for the istimā‘. Is the ṣawt itself sung by only one muṭrib within the faṣl? All the songs are performed solo, but this does not necessarily imply the presence of only one muṭrib in the jalsa. Many can participate in this fann and the same muṭrib is not required to perform all the sections of the faṣl. For example, the khitām marks the end of the jalsa. Nothing can be performed after that. It is as if we were saying: “let’s eat, the performance is over”. What is the duration of this faṣl in a regular jalsa? Here is an example of ṣawt ‘arabī. What did we just listen to? So this was the ṣawt’s faṣl that we talked about. The ṣawt itself includes specific parts: first, the percussions-free istimā‘ in the beginning of the jalsa. Then the khitām that has a specific rhythm –rare today– that ends the jalsa and is of a particular nature. In the past, the ṣawt ‘arabī and the ṣawt shāmī sometimes included two ṣawt. They ended with a section called tawshīḥa or tawshīḥ. Thus, the muṭrib performing a tawshīḥ marked the beginning of the end of the concerned melody. While the ṣawt khayālī does not include any tawshīḥ and is closer to an ordinary song, with the addition of the mirwās. 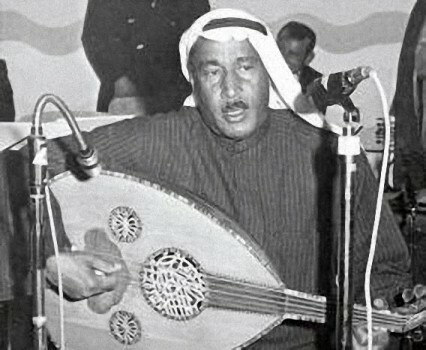 In Kuwait, the tawshīḥa shared –in the past– the same rhythm and maqām with the melody of the original ṣawt: if the ṣawt were to the ḥusaynī maqām, the tawshīḥ was also to the ḥusaynī; if the ṣawt were to the rāst maqām, the tawshīḥ was also to the rāst; and if the ṣawt were to the sīkāh maqām, the tawshīḥ was also to the sīkāh. So the tawshīḥ comes at the end of the ṣawt…? Yes, the tawshīḥ is the last section, the last quarter of the ṣawt. The tawshīḥ is rich: it may either be instrumental, or both instrumental and vocal. It must end with taqsīm that are normally the last part of the ṣawt. Today, the tawshīḥ has become essential, whereas in the past ṣawt ‘arabī or ṣawt shāmī could end without it or without a taqsīm. Today, all ṣawt ‘arabī and ṣawt shāmī include taqsīm and a tawshīḥ. Could you play a tawshīḥ for us? As I mentioned earlier, it used to have a unique rhythm and it still does, whereas the maqām is not a unique maqām anymore. The tawshīḥ is to the same rhythm and maqām of the ṣawt…? It used to be. 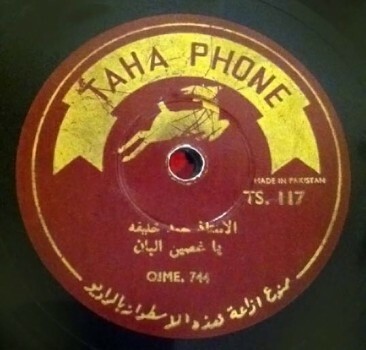 But today only the rhythm is the same, while when it comes to the maqām, most performers play a specific tawshīḥa or one of the tawshīḥa’s melodies… one unique melody. I played one paragraph of the ṣawt followed by the famous ṣawt shāmī tawshīḥa “Yā Umm ‘Amrūh”. 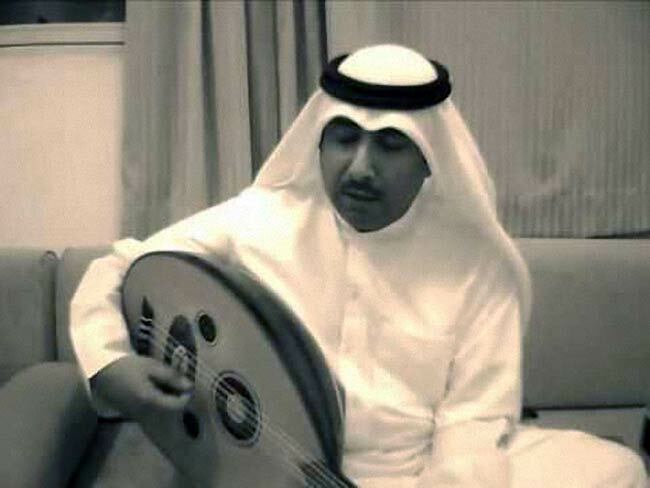 There is another ṣawt ‘arabī melody. The end of the ṣawt’s part then the tawshīḥ. The following ṣawt ‘arabī tawshīḥa, like the ṣawt shāmī tawshīḥa we have just listened to, is to the rāst maqām. What are the instruments required for the performance of a ṣawt? Two essential instruments are required for the performance of a ṣawt: the ‘ūd and the mirwās (ṭabl dedicated to the performance of the ṣawt). What does the mirwās look like? The mirwās is circular and covered with leather on both sides. It is held in one hand and played with the other. In order to play the dum and the tak, the finger’s position on the leather changes, while the other hand controlling the rhythm moves in a specific way to help perform the dum or the tak… Playing the mirwās requires a complex technique, completely untraditional, and that has no equivalent in the entire world. Thus, the ṣawt requires the ‘ūd and the mirwās. Other instruments such as the violin, the nāy and the qānūn can be added. But they are not essential to performing a ṣawt, while there can be no ṣawt without a mirwās. I just played a ṣawt only with a ‘ūd. Anyone who knows ṣawt will know this was a ṣawt… but these fann can’t be performed like that. They require a mirwās. So these were the instruments for the performance of a ṣawt. There can be no other percussion instrument besides the mirwās. At a certain point in time that I call the Egyptian phase in the History of Kuwaiti music, i.e. 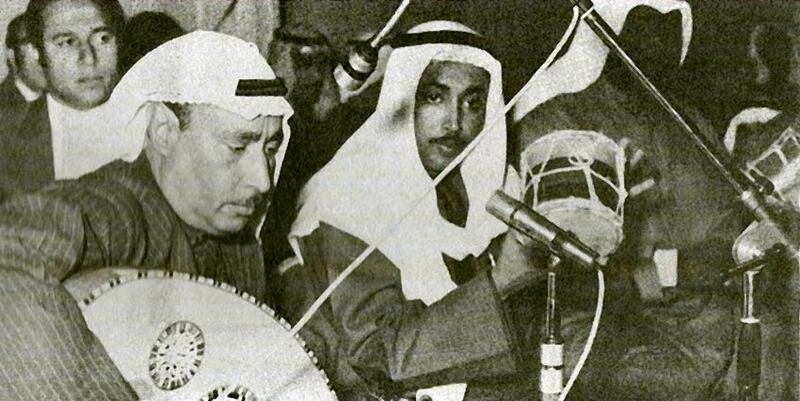 in the 50’s and 60’s, some ṣawt were performed with a mirwās and a riqq –that we call daff. But this does not represent the true jalsa performance. To end this episode, which recording of ṣawt performed with ‘ūd and mirwās will you play for us? 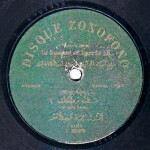 Let us listen to a recording made on a shellac disc as well as on a plastic disc of muṭrib Muḥammad Khalīfa singing ṣawt “Yā ghuṣēn el-bān”.